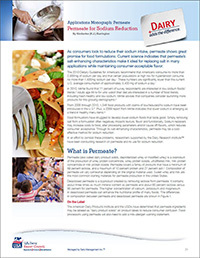 As consumers look to reduce their sodium intake, permeate shows great promise for food formulations. Current science indicates that permeate's salt-enhancing characteristics make it ideal for replacing salt in many applications while maintaining consumer-acceptable flavor. In an effort to combat these problems, researchers supported by the Dairy Research InstituteTM have been conducting research on permeate and its use for sodium reduction.